Best practice management tools for pastoralists were explored through local case studies at an Annual Field Day in the Goldfields-Nullarbor region. 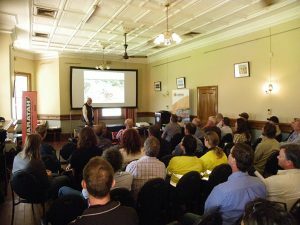 Held in October 2018, the Goldfields-Nullarbor Rangelands Biosecurity Association (GNRBA) annual event was eagerly anticipated by people in the region and had excellent attendance. The GNRBA is the leading pastoral representative body in the Goldfields region. Supported by Rangelands NRM through funding from the Australian Government’s National Landcare Program, the event had a variety of demonstrations, best practise discussion and peer learning, focusing on topics relevant to the pastoral community. Rangelands NRM’s Southern Rangelands Program Manager Kane Watson said topics included fencing for total grazing pressure management, weed control, re-hydration, road maintenance, herd and grazing management. “The advancement of these initiatives provides improved pasture base with ecological and production benefits, both enabling improved preparedness for climate change,” Kane said. “Thanks to the effort of Justin Stevens at Mt Vetters Station we had an excellent turn out—nearly 80 people across the two days,” Project Officer for the GNRBA Erin Gorter said. “The presentations were very relevant to pastoralists in the region,” she said. They covered cattle and sheep markets, Lands Department considerations, electric fencing technology, telecommunications, trap setting, yard design, vaccination, hay feeders, fit to load guidelines, fencing materials, carbon market opportunities, communications and connectivity to name a few. GNRBA outgoing CEO, Ross Wood facilitated discussion and several hands-on activities and demonstrations such as setting of traps and yard handling of stock. Erin said the successful format of being outdoors in the morning, then heading inside for the warmer afternoons, followed by the annual get together dinner, has proved to be a great way to bring people from the region together. Discussion about rangelands carbon with the panel of Dean Revell, Tim Moore and Tim Wiley provided hot debate for the future of rangelands regeneration and the opportunities available to land managers, promoting regenerative practises, providing economic incentive and building ecological resilience. There was a full house for the GNRBA Annual Dinner with an extremely talented magician who kept everyone mesmerised, then allowing for plenty of time for pastoralists and industry from near and far, to network further over a delightful meal. The dinner has been reinstated in the past couple of years, with members and industry supporters relishing the opportunity to network informally. Ross Woods used this opportunity to welcome the incoming GNRBA CEO, Michelle Donaldson, who officially took the position in December 2018. [Top] GNRBA field day discussion at Mt Vetters Station, image courtesy of Erin Gorter. [L] GNRBA outgoing CEO, Ross WOOD, discussing the activities he has undertaken at Rawlinna Station in recent months, image courtesy of Erin Gorter.